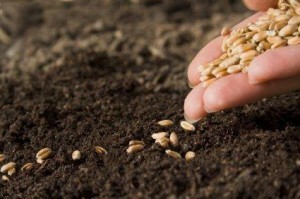 To produce a good crop, every farmer or gardener knows that you need good quality seed. Appearance and tests can be used as a basis to select quality seed. Quality seed should have the following characteristics: purity, germination, weight, and color. Purity usually cannot be determined by looking at the seed or by a lab test. One must have absolute knowledge of the source by reading the seed tag and relying on the credibility of the seller. Testing is the only reliable means of determining the ability of the seed to germinate and the presence of disease. Visual inspection can not determine germination. Testing a good representative sample is the only way to ensure the seeds will grow. High test weight per bushel indicates well-matured seed. Large, well filled, plump kernels produce fast growing, healthy seedlings that may tiller more. Such seedlings can withstand early growing season stress, have more expansive root systems, compete more effectively with weeds and are better able to tolerate low levels of disease.